Eric Rolland, Tim Getman, Adam Jonas Segaller et al. DVD: 375 min., Blu-ray: 375 min. Meet the titans who forged the foundation of modern America and created the American Dream. 'The Men Who Built America' mini-series shines a spotlight on the influential builders, dreamers and believers whose feats transformed the United States, a nation decaying from the inside after the Civil War, into the greatest economic and technological superpower the world had ever seen. 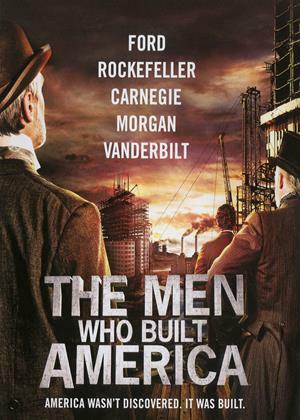 'The Men Who Built America' is the story of a nation at the crossroads and of the people who catapulted it to prosperity. I've awarded three stars largely because overall these DVDs were informative, giving some interesting background to names familiar to me but not, until now, in particular detail. Rockefeller et al, these were hard men who may have through their determination and ruthlessness made the United States the pre-eminent industrialised nation but who did so at great cost to those in their employ. Carnegie, for instance, I had associated mainly with the public institutions which bear his name and which he generously supported. How he made his vast wealth, however, rather takes the shine off his benevolence. These two discs contain six TV programmes made by PBS. Unfortunately, presumably because they are made for (American?) TV the seams show where they break off for adverts and, even worse, after each obvious break much of what had gone before is given a resume as though one couldn't keep in mind what had gone before. Ditto at the beginning of each of the six programmes when even more time is wasted replaying a fair bit of what had been previously shown on the earlier disc. I shall therefore avoid anything other than purposely made, stand alone, documentaries when making future choices of viewing. One last thing,: Henry Ford is given equal billing to Vanderbilt and the other magnates at the beginning of each section and yet is allowed no place in the stories we are told here. Odd. Plus Bonus Footage - Never Before Seen On TV: "Carnegie"; "From Rich to Richer"; "The American Dream"; "Monopoly"; "Competitive Nature"; "The Everyman"; "The Rise of Cornelius Vanderbilt" and "Traits of a Titan"